Of course dad was not alone in his work, nor was he alone in influencing so many people. Mom, (Marion Ann Exum), was not only his helper, and one who completed dad’s life for almost 61 years, but she was a friend, counselor, good listener, teacher, confidant, and she was mom, not only to Bob, Ed (Deceased), Sharlene (Deceased), Sandy, Tammy and myself… but to hundreds and thousands around the world. 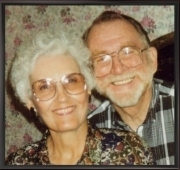 This web site is lovingly dedicated to the memory of Jack and Ann Exum, and it is our hope that you will find encouragement, laughter and even a few tears… as you explore the memories and writings. It is our hope, that you will also be inspired in your own work for the Lord as you read articles, many of which were only published in the local Lake City Reporter. The books which were written by dad, are for sale. Please look at the “Books by Jack Exum” page for more information about all books.You will find other things on jackexum.com which we hope you will enjoy including, “Thru The Years” which consists of a growing number of pictures from a ‘treasure’ found at mom and dad’s house as well as our own pictures. You will find articles and lessons and studies here as well which you can respond or comment on. Everything is presented to simply encourage, and promote unity through the great grace of God and share His love and His message. A SPECIAL SECTION has now been opened, as we begin to make available (for sale in MP3 format)… AUDIO LESSONS by mom and dad. 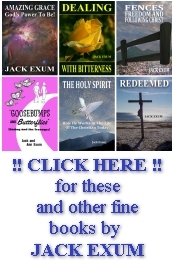 Just go to the “Three Unusual Days” section and go to the ‘Exum Audio Sermons’ and browse around. We also have a Bible study for you which is free of charge entitled Open Bible Study featuring the book “Basic Bible Course”. Gospel of John - Lesson Six - John 3 - A New What??? Gospel of John - Lesson Five - John 2b - Cleansing Out God's House! Gospel Of John - Lesson Three - John 1:35-51 - "Glory Of The Ordinary"
SPECIAL: MP3 (Long Play Album) "Winning Over Worry"
SPECIAL: MP3 (Long Play Album) "All The Way Is A Long Long Time"
Exum's To Keene New Hampshire! "Thank God for Forgetfulness We have To Move On"
"Five Hurtles To Radical Faith"
Restoration and Unity - Let's Get To It! "Redeemed" - "A Personal Note From Dad"
"Redeemed" - Lesson Thirteen - "Gehenna" "The Final Place Of The Wicked"
"Redeemed" - Lesson Twelve - "Heaven Bound"
"Redeemed" - Lesson Eleven - "Today Is The Day Of Your Salvation"
"Redeemed" - Lesson Ten - "Be Filled With The Holy Spirit"
This site is growing… so keep looking for more and more materials as it grows. Your comments and suggestions are truly appreciated. I appreciate your patience as I correct inadvertent mistakes in spelling or just try to say something in a better way. My heartfelt thanks to the many supporters of this site. You are so greatly appreciated. Special thanks to Earl Chinnici (earlshelpdesk.com) for his fine work in building this web site, and for continuing to work with me in publishing dad’s books in e-Book format. His work, from the redesigning of the book covers to the publication, has just been fantastic.